All painting is practice and so is this. I was mostly satisfied with the subject matter, perspective and mood of this painting but not the contrast, balance or the detail. Sometimes that's the way it is with oil paintings. I try hard to get things right, but inevitably fall short of my own expectations. It is frustrating. One good thing about oil is that you can rework it. And sometimes the best thing to do is to just walk away from a painting for a while and come back to it later. 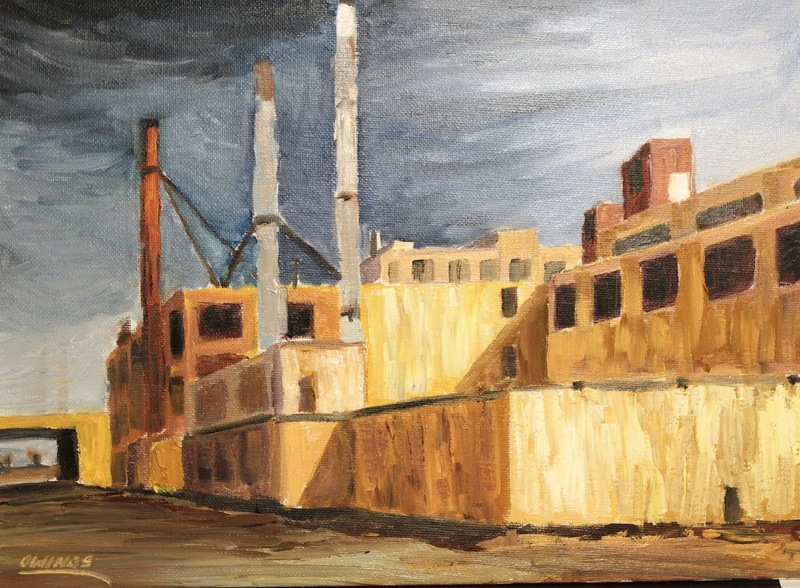 The subject for day 20 of the project is the old 3M factory on East 7th street in Saint Paul. A relic from the fast fading American industrial era, this place provided great jobs for a couple of generations and anchored a community. Now, like the era it is from, its days have come to a close. There is a big ugly green FOR SALE sign on it now and if you drive by it at night there are just a few lights on inside as only workers left are security guards who wander its empty halls and floors. Wow, my father-in-law retired from there. It's a historical painting. Maybe you could do a series of Twin Cities historical paintings. I would find them very interesting. You could also give a presentation and tell historical story for people who love history in that area. Or maybe you could make a series into a coffee table art book of twin cities places of interest. You already have quite a few just in this 21 day art project.